Roman Thought | IMPROVEACRATI.....improve.....grow.....excel ! Dr Engels argues Augustan-style authoritarianism would be the best practical solution to Europe’s current woes as he sees them – mass immigration, low national fertility rates, the decline of the family and traditional values, materialism, egoism, globalisation, insecurity, and a growing democratic deficit caused by spiralling inequality and technocratic tendencies. Augustus’s own autobiography is a towering example of “alternative truth”. It’s a boastful retrospective, but other evidence suggests this masterly piece of propaganda closely reproduces the artful politics he adopted after his grand-uncle, the dictator Julius Caesar, was stabbed to death in the Senate in 44 BCE. Augustus repeatedly conducted murderous as well as bloodless purges of the aristocracy from November 43 through to 29 BCE, repressing all political opposition. 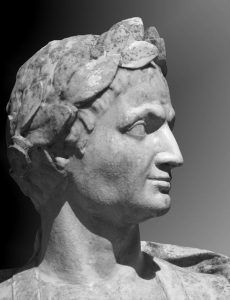 Late in 43, he and his then-allies Mark Antony and Lepidus ruthlessly proscribed over 300 senators and 2,000 equestrians (the lower aristocracy and business elite). Many were hunted down and butchered in plain view, including the great orator and republican Marcus Cicero. In 27 BCE, when he finally laid down his official emergency powers – powers he had alleged were needed to confront real or imaginary crises he and his henchmen had engineered – a compliant Senate promptly reinvested him with a vast, 10-year military command. This command was the cornerstone of his autocracy, and was suitably renewed every 10 years, invariably justified on the grounds of ongoing military exigencies in the provinces. Similarly, Hitler’s power grab in Germany in 1933 was right out of the Augustan playbook. Blaming an arson attack on the German Reichstag (parliament) on the Communist opposition, Hitler was able to pressure an ailing President Hindenburg to decree him emergency powers. This nullified many civil liberties and transferred key state powers to his Nazi-led government. “The Republic of Rome provides those who go into public life with everything they need,” …………. Reputation was far more important to this Roman – and This is what make a People Great. Titus, Nerva, Trajan, Hadrian, Antoninus, and Marcus had no need of praetorian cohorts, or of countless legions to guard them but were defended by their own good lives, the good-will of their subjects, and the attachment of the senate. The 18th-century historian Edward Gibbon, in his work The History of the Decline and Fall of the Roman Empire, opined that their rule was a time when “the Roman Empire was governed by absolute power, under the guidance of wisdom and virtue”. “If a man were called to fix the period in the history of the world during which the condition of the human race was most happy and prosperous, he would, without hesitation, name that which elapsed from the death of Domitian to the accession of Commodus’. “The forms of the civil administration were carefully preserved by Nerva, Trajan, Hadrian and the Antonines, who delighted in the image of liberty and were pleased with considering themselves as the accountable ministers of the laws’. “Such princes deserved the honour of restoring the republic, had the Romans of their days been capable of enjoying a rational freedom”. Thucydides has been enjoying quite the media moment, despite being dead for more than 2,400 years. Defense Secretary Jim Mattis and national security adviser H.R. McMaster have both been known to cite the Greek historian’s “Peloponnesian Wars,” which narrates the ancient conflict between Athens and Sparta. Until fairly recently, the leading lights of Europe and America would have agreed. Plutarch’s “Lives,” which details the characters and careers of Greek and Roman men of action, were considered essential reading for citizens and statesmen. When the Founding Fathers clashed in political pamphlets, they wrote under names like Publius, Cato and Brutus. Alexander Hamilton was a huge Plutarch fan. So was his rival Thomas Jefferson, who recommended the “Lives” to several correspondents and made sure the University of Virginia had a copy. For more than a century after America’s founding, the classicist Meyer Reinhold has claimed, Plutarch’s Lives was the country’s most-read book after the Bible. What made Plutarch so popular? He offered an education in civic virtue, packaged in a way that was pleasant to read. Our closest translation of the Greek word for “life” used in the book’s title is “biography,” but it can also mean “way of life.” Plutarch’s “Lives” offered both: It described each subject’s actions and character from birth to death, providing models for the reader to emulate. Thanks to Plutarch’s taste for the fine details that he says reveal “the signs of the soul in men,” citizens of the new American republic could intimately know the legends of antiquity and shape their own souls accordingly. Plutarch also wrote his lives in parallel: He paired Greeks and Romans, concluding each presentation with a short “comparison” that prodded readers to decide which of the two was superior and in what respects. The point wasn’t to show that the Greeks were better than the Romans or vice versa, but to reveal the character of the competitors and nudge readers to form judgments about virtue. Consider one pairing: Pericles, the great Athenian general who lived around 450 B.C., and Fabius, the consul of the Roman Republic who came along about 200 years later. It’s easy to admire both passively. Asking readers which of the two is better forces them to consider what exactly “better” means and how it applies to particular cases. Plutarch put his readers into the role of citizens casting a vote between worthy statesmen. Plutarch did so, however, long after the ancient republics had declined. A citizen of the Roman Empire, he lived around A.D. 100 in the small Greek city of Chaeronea. He held local office and spoke with disdain of talented peers who decamped for careers in the metropolis. Fellow Greeks, he advised, should keep good relations with their Roman rulers, but not be too hasty to involve Rome in local affairs. Because Plutarch wrote at some remove from the lost world he depicted in his “Lives,” some readers have found him unreliable and out of touch. The British historian Thomas Macaulay wrote in 1828 that Plutarch and similarly earnest writers “conceived of liberty as monks conceive of love.” But Plutarch’s distance from the pre-imperial politics he depicted was also an advantage. It allowed him to view the sweep of history, from the formation of the Greek cities to their subjugation, and from the mythical founding of Rome to the end of the Republic. Plutarch distilled it all into a curriculum of contests meant to stimulate civic virtue no matter the context of his readers. Today statesmen are scouring Thucydides for some rule so timeless that it applies to modern America just as well as it did to ancient Greece. To the extent that any such rules exist, Thucydides is surely a worthy guide. But Plutarch suggests that citizens and politicians need a different kind of education. The goal is teaching them to practice good judgment and hone their ability to discern when a proposition holds true and when it does not. Plutarch aspired to shape character, whether his readers were local leaders in small Greek cities or important officials in Rome’s imperial hierarchy. He showed citizens how to admire and censure those in power, not to mention how to evaluate candidates for such positions. Two millennia later, in an age of novel threats and rising dangers, they still don’t come any better than old Plutarch. Scipio Africanus was,. among other things, a Roman intellectual who wrote his memoirs in Greek. As a soldier he defeated Hannibal at Zama, the final battle of the Second Punic War – by taking the War to Carthage instead of fighting it in Italy only. His offensiveness was in sharp contrast with Fabius’ tactic of not giving battle. Recognized as one of the finest commanders in military history. He was Rome’s greatest general who never lost a battle. Just prior to Zama, Livy writes that Scipio’s men captured a couple of Hannibal’s spies. Scipio ordered that they be fed and feted and shown around the entire camp before being escorted back midway to Hannibals camp. Livy, the Roman historian narrates that when both were in exile from their respective countries they came across one another and reminiscenced. Hannibal when asked, took the high road and assessed that the greatest generals were Alexander, Pyrrhus and himself. When Scipio asked what would have been the order had Hannibal defeated him, he replied that then he would have been the greatest. Here are Scipio’s few known sayings. which, mirror the man. I’m never less at leisure than when at leisure. Or less alone than when alone. It is the part of a fool to say that which I should not have even thought. Quintilian was a rhetorician much referred to in medieval schools of rhetoric and in Renaissance writing. While we are making up our minds as to when we shall begin, the opportunity is lost. We must form our minds by reading deep rather than wide. Men, even when alone, lighten their labors by song, however rude these may be. Pleasant it is to behold feats of war over the plains with no part of you in peril. The fall of dropping water wears away the Stone. The sum of all sums is eternity —- Life is one long struggle in the dark. And life is given to none freehold, but it is leasehold for all. Never does nature say one thing and wisdom another. Censure acquits the raven, but pursues the dove. I wish it, I command it. Let my will take the place of a reason. Marcus Aurelius Antonious was last of the Five Good Emperors and the most important stoic philosopher. His tenure was marked by wars in Asia and with Germanic tribes in Gaul and across the Danube. His Meditations, written on campaign is revered as a literary monument to a government of service and duty. Begin – to begin is half the work, let half still remain; again begin this, and thou wilt have finished. Forward, as occasion offers. Never look round to see whether any shall note it. When you arise in the morning, think of what a precious privilege it is to be alive -to breathe, to think, to enjoy, to love. Be satisfied with success in even the smallest matter. When thou art in any measure angry, bethink thee how momentary is man’s life. How much more grievous are the consequences of anger than the causes of it? Time is a sort of river of passing events, and strong is its current; no sooner is a thing brought to sight than it is swept by and another takes its place; and this too will be swept away. And thou wilt give thyself relief, if thou doest every act of thy life as if it were the last. The happiness of your life depends upon the quality of your thoughts. Your life is what your thoughts make it. You have power over your mind – not outside events. Realize this, and you will find strength. Adapt yourself to the things among which your lot has been cast and love sincerely the fellow creatures with whom destiny has ordained that you shall live. We ought to do good to others as simply as a horse runs, or a bee makes honey, or a vine bears grapes, season after season, without thinking of the grapes it has borne.